It is well known that too little water can cause plants to wilt and even die, but over-watering can produce similar problems as the roots rot - a problem to which young plants in pots are very prone. In addition, stress caused by irregular watering can cause some plants to bolt (run to seed), yielding a very poor crop. Supplying the right amount of water is quite an art and is essential to ensuring that you produce a decent harvest of fruit and vegetables. Your crops need different levels of water depending on their stages of growth, their position in the garden, the soil type, weather conditions and the variety. For example if you grow your crops on a sandy soil (which doesn’t hold water well) you may need to water your crops every day in the height of summer (and incorporate organic matter such as compost to aid moisture retention). On the other hand, crops grown on clay soils (which are more moisture retentive) need watering less often. Heavy clay soils are prone to waterlogging, but the regular addition of organic matter can help overcome this problem. Generally, plants need watering more often if they are grown under cover (such as in a cloche or a greenhouse) or if you grow them in a container where there is less soil to absorb moisture. You should also consider the position of the plants you grow. In full sunlight, water from the soil’s surface will evaporate more quickly than in the shade. Many vegetables need extra water when in flower or when fruiting. For example legumes (beans and peas), sweet potatoes and corn require more water when in flower. Tomatoes and squash plants such as zucchini and pumpkins benefit from extra water when their fruit is developing. Peas and beans will develop heavier pods if watered regularly after flowering but too much water early on will result in extra leafy growth and fewer flowers and fruit. Leafy greens and root vegetables require regular watering throughout their growth. Over-watering your crops can create the perfect conditions for disease to thrive and may also encourage slugs and snails. If water runs off the soil, it can wash away valuable nutrients. Plants will develop weak, shallow root systems which are less resistant to drought. If plants are allowed to sit in water, they will be starved of oxygen and ‘drown’. Avoid over-watering plants by checking the soil’s moisture level below the surface before watering using your finger. It should feel damp but not soggy. If you grow your crops in containers, ensure there are adequate drainage holes. Seedlings require particular care. The soil or compost should be moist but not wet. When starting seeds off, water them with a fine mist to avoid saturating the compost or washing the seeds away. Once the seedlings are growing well, a good technique to use is to dip the pot into a tray of water rather than watering from above. The water should not come above half way up the pot and after a short time, it can be removed, drained well and returned to its place. One of the reasons this method works so well is that you develop a feel for how heavy the pot should be when it has absorbed enough water and can then water more or less the next time. If your crops are wilting, it is likely to be due to too much, or too little, water. If the soil is dry above and below the surface, water immediately (regardless of the time of day) and, if possible, shade the plant from the sun. If you grow your crops in containers, move them into a shady position. If the wilting is due to too much water, check to see if the plant is sitting in water. 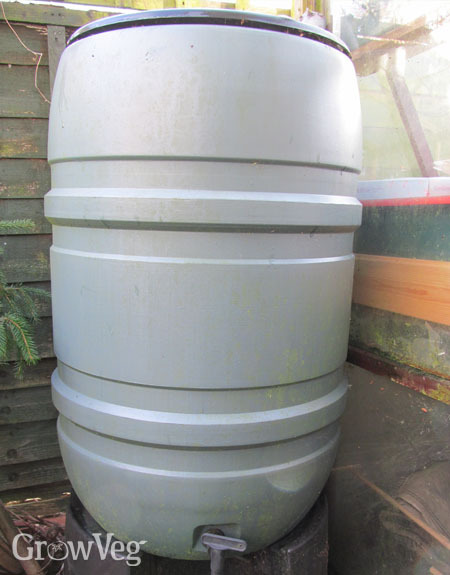 Ensure water can drain away from the base if growing in a container. If the soil is waterlogged, use a fork to puncture the soil to aid drainage. You can also mound soil up around the base of the plant to encourage further water to drain away. Avoid watering again until the soil is dry. The best time to water your vegetables is in the morning. This ensures the water is fully absorbed by the soil and roots. Watering in the heat of the midday sun means that the water is likely to evaporate rather than be absorbed by the plant’s roots. Watering at night can attract slugs and lead to the onset of diseases such as mildew and black spot. Make sure you water your plants thoroughly. If you only sprinkle water on the soil’s surface, the plants will develop shallow root systems (which will need watering more often). A thorough soak will penetrate the soil’s surface and ensure your plant is well nourished. When planning your plot you should consider grouping the thirstiest vegetables in the same area to make watering them easier. A well-planned plot should have water butts stationed in convenient locations so you don’t have to travel far to access water. Some larger gardens and allotments can benefit from an irrigation system (such as a seep hose) – particularly useful if you plan to be away on holiday during crucial summer months. "I would like to start organic farming for vegetables by making pipeline with sprinkler system is any body to guide or make the system for me?"